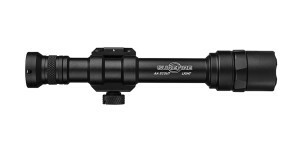 SureFire has announced the release of the new M300B Mini Scout Light. This latest version of the Mini Scout Light provides 200 lumens of TIR focused light output, nearly double that of its predecessor, the M300A. The new M300B is machined from high strength aerospace aluminum with Mil-Spec hard anodizing and will be available in black or desert tan finish. The light may be fitted with either of two different switches, both included. The first is a tape switch with a 7-inch cable providing momentary actuation, while the second is a tailcap pushbutton switch allowing the user to press slightly for momentary or press further until it clicks constant-on. The M300B provides 1.3 hours of tactical runtime with the included 123A lithium battery and is compatible with LFP 1232A lithium-phosphate rechargeable batteries. 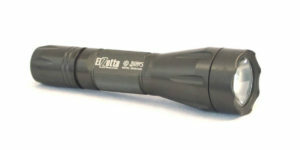 Owners of previous ScoutLight models can upgrade their existing lights to match the M300B’s performance with the addition of the new KE1A replacement head, available for purchase separately. 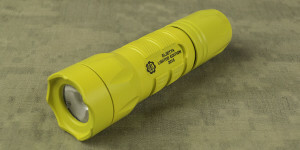 Also, users requiring a more diffuse output or colored beam may be interested in the new SureFire diffuser and colored filters available for the M300B and newer E-series flashlights. The M300B carries an MSRP of $369.00 but will likely sell for around $260 at retail. 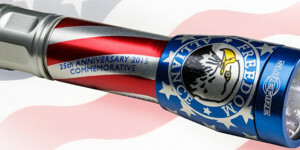 For more information, visit SureFire.com. 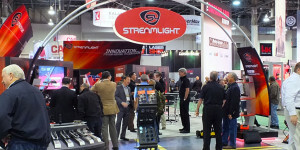 Posted in Flashlight News and tagged Surefire, Weapon Lights.